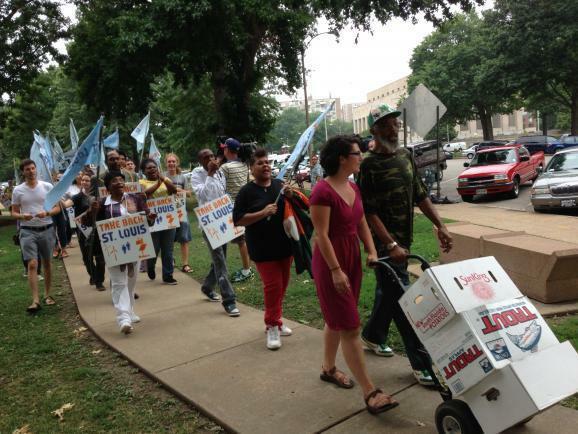 Supporters of a ballot measure that would limit who can receive tax breaks in the city of St. Louis drop off signatures on July 31, 2014. A judge has permanently blocked a voted on the measure. 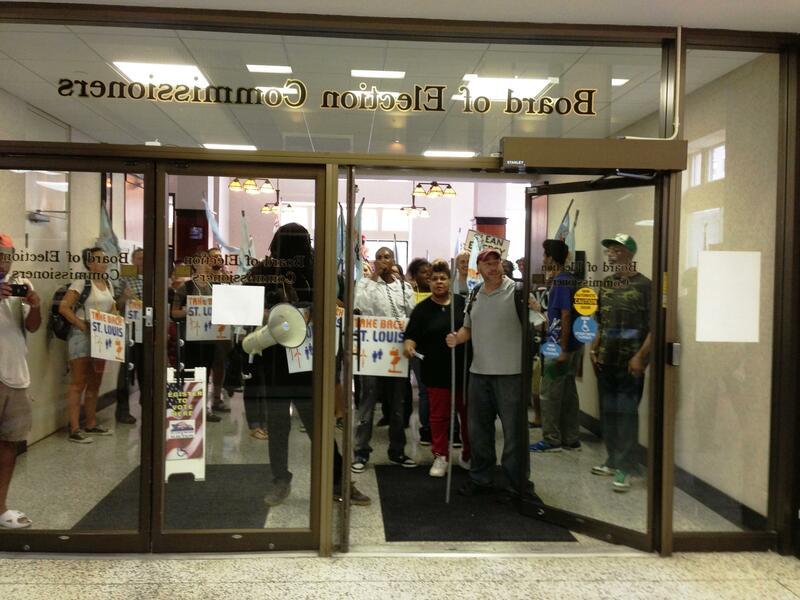 Updated June 30, 2015 with appeals court ruling - A Missouri appeals court panel has rejected an effort by St. Louis-based activists to limit the economic incentives by the city to Peabody and other energy companies. The Take Back St. Louis initiative was a charter amendment that would have prevented St. Louis from granting tax increment financing or special business districts to companies that extract non-renewable energy resources. What's more, any companies that did more than $1 million in business with those so-called "unsustainable energy producers" would have also lost out on tax incentives. It also called on the city to develop and publish yearly and five-year sustainable energy plans that would have provided public incentives to green technology. The three judges ruled that the proposed amendment was unconstitutional on its face because it directly conflicted with state laws governing economic development tools. "The statutes grant the city full discretion in deciding who can make use of a TIF plan or special business districts, and the Initiative Petition would forbid the city from even considering a plan from any person or group the Initiative Petition defines as an Unsustainable Energy Producer. Simply put, the statutes permit what the Initiative Petition attempts to prohibit, and therefore the Initiative Petition is unconstitutional under Article VI, Section 19(a)." In a statement, Take Back St. Louis said it was disappointed, but not surprised by the appeals court ruling. It is yet another example of business as usual in a region tightly controlled by a handful of the St. Louis 1%. The judicial system is part of the same interlocking system that moves an agenda of redistributing wealth upward to the rich and corporate profits, rather than down to the people with real needs. A St. Louis Circuit judge has permanently blocked a ballot measure that would have allowed voters to put restrictions on which companies could receive tax incentives. Judge Robert Dierker ruled on Tuesday that the Take Back St. Louis initiative was "illegal and void on its face" because it conflicts with Missouri laws governing tax increment financing and special business districts. "The sustainable energy amendment unquestionably would engraft upon the [state economic development] statutes an exclusion of a class of "unsustainable energy producers" from participating in or receiving benefits from "TIF" plans or special business districts. Indeed, that is one of the primary purposes of the sustainable energy amendment. The sustainable energy amendment would prohibit what the state statutes permit, namely the participation of entities defined by the amendment as "unsustainable energy producers" in programs under the statutes." The proposed charter amendment would have prevented the city from awarding those incentives to companies that extract non-renewable energy resources. What's more, any companies that did more than $1 million in business with those so-called "unsustainable energy producers" would have also lost out on tax incentives. It also called on the city to develop and publish yearly and five-year sustainable energy plans that would have provided public incentives to green technology. Plaintiffs in the case were represented by a former lobbyist for Peabody, Jane Dueker. The St. Louis Board of Election Commissioners and the city of St. Louis were named as defendants, although supporters of the Take Back St. Louis initiative were allowed to intervene. Dueker made seven arguments in favor of the injunction. The amendment is invalid because it forces the expenditure of money. Ruling for defendants. The petition contained numerous procedural defects. Ruling for defendants. The way the amendment would appear on the ballot does not comply with city statutes. Ruling for defendants. The amendment violates the equal protection clause of the state constitution. Dismissed as moot. Seeking injunctive relief. Ruling for plaintiffs. The language and reasoning in Tuesday's ruling mirrored an earlier one from Dierker that blocked a vote on the measure in April. In a statement, Take Back St. Louis spokeswoman Arielle Klagsbrun called the decision deeply disappointing and said that Dieker "chose to side with the corporate plaintiffs instead of the people." The initiative's supporters had argued the amendment simply shaped the discretion the city has in awarding tax incentives - an argument Dieker rejected. "While the Judge asserts that any local direction on these tax breaks conflicts with state law, the Take Back St. Louis campaign strongly contends that the Mayor's office every day directs and makes judgments on who gets tax breaks in the City of St. Louis. An average person does not have the same shot at a tax break in this City as a billion-dollar corporation. The Take Back St. Louis initiative was initially conceived to correct the Mayor's failings in gouging the St. Louis Public Schools and other public programs in order to subsidize corporations," Klagsbrun said. Klagsbrun was also highly critical of Dierker for using the Equal Protection Clause to prevent St. Louis citizens from voting on the measure. Doing so, she said, shut down a conversation about how development dollars are used in St. Louis. "For people that have tried to stop tax breaks for corporations in this city or have tried to work with the mayor’s office in terms of pushing for a true sustainability agenda, you can see that corporations and that Mayor Slay’s relationships with those corporations are blocking the conversation at just about every single step," she said. While Dierker avoided ruling on the equal protection question, he devoted several pages of his ruling to the issue to "ensure that the record is complete." And while he agreed that lawmakers generally have wide latitude in creating different categories, he could not find a rational reason for doing so in this case. "Considered as a whole and in light of its plain language, the manifest purpose of the sustainable energy amendment is not so much to advance the use of approved fuels, as to punish enterprises which deal in the disfavored fuels and to punish the enterprises which deal with the disfavored energy producers. On its face, the amendment lacks a rational relationship to a legitimate government end, and is unconstitutional. To be sure, interveners [the amendment's supporters] have every right to disapprove of and seek regulation, or even the prohibition of the production or use of fossil or nuclear fuels, but they must do it in conforming to the constitution, which, like it or not, protects fossil fuel producers as well as anarchists. Jason Hall, the corporate counsel for the St. Louis Regional Chamber, applauded the ruling, saying it protected the economic interests of the region from a narrow interest group while preserving the rights of citizens to push for change through the initiative process. A spokeswoman for Mayor Francis Slay issued a similar statement. Nicholas Curry's sleeping arrangement has changed a bit over the last couple of days. Curry, a junior at Washington University, has been camping out in a tent near Brookings Hall. 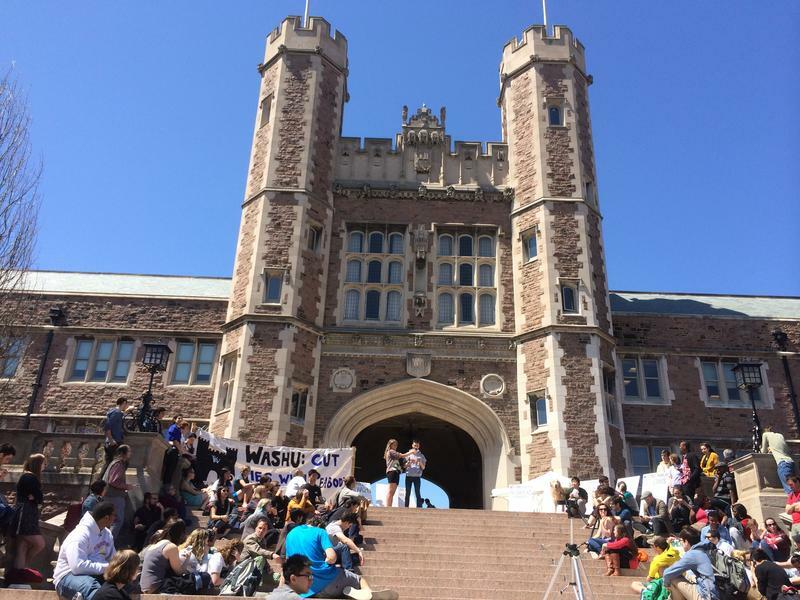 It's part of a "sit-in" to get Washington University to cut ties with Peabody Energy, a large coal company that's headquartered in St. Louis. "I slept out here with my dog Max," Curry said. "So, we spent the night here last night, and we'll be here tonight." When St. Louis Judge Robert Dierker issued a preliminary injunction against the Take Back St. Louis initiative, it knocked the measure off of the city of St. Louis’ April municipal elections ballot. But that doesn’t mean the fight is over. Both sides are heading back to court on Monday to potentially decide the future of the ballot initiative.